To The Batpoles! 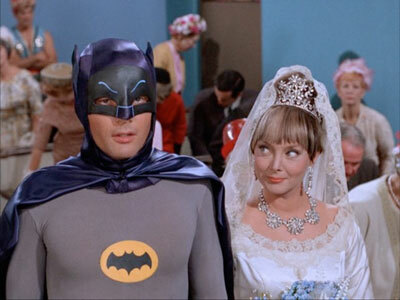 Batman 1966: #042 Marsha, Queen of Diamonds: Lots of filler? Not so fast! #042 Marsha, Queen of Diamonds: Lots of filler? Not so fast! Various other Bat-commentaries paint this arc in drab tones. What Carolyn Jones (apparently replacing Zsa Zsa Gabor at something close to the last moment) brings to the role of Marsha, Queen of Diamonds, is basically Morticia Addams with a different look, says conventional wisdom. The arc is full of filler scenes that don’t advance the story, say commentators. In this episode of To the Batpoles, Paul presents a much different view of Marsha, which sees these “filler” scenes as absolutely necessary to the theme of this arc. And what is that theme? Listen to find out — and pack your Coleman stove, because there WILL be camping! PLUS: The Jam’s version of the theme; an intertextual reference in Marsha that you might have missed; Tim investigates the “bat-cave scene” from spaghetti western The Relentless Four that Adam West described in Back to the Batcave, and works to track down the original Jay Thompson script that was rewritten into The Impractical Joker; and your mail!